A Breakthrough Clean Technology Is Giving One Tiny Company the Power To Extract $25 Oil In A $70 World. Now Petroteq Energy Inc. (TSX:PQE.V; OTC:PQEFF) Is Gearing Up To Take The Energy Industry By Storm! The Technology - Heavy oil is a dirty word in the energy industry. But that could all be about to change. Petroteq has pioneered a proprietary clean EOR (Enhanced Oil Recovery) technology to solve the problem of dirty oil sands extraction. It cheaply extracts 99 percent of all hydrocarbons, without producing any greenhouse gases. The Property - At their Asphalt Ridge project, they have an estimated 86 million barrels of “trapped” heavy oil equivalent worth $5.2 billion. Thanks to their extraction breakthrough, they’re aiming to harvest this resource for as little as $25 per barrel. The Big Picture - There are over 1 trillion barrels of “trapped” heavy oil in Utah, Colorado and Wyoming, not to mention trillions more worldwide. Petroteq is filing patents around the world, and their licensing opportunity is enormous. In the epic battle between OPEC and the U.S. for global market share - low cost producers are set to reap a stunning energy investor windfall. We’re focusing on one little company - Petroteq Energy Inc. (TSX:PQE.V; OTC:PQEFF) - which is unlocking trapped oil in U.S. oil sands for as little as $25/barrel. Technology is their key advantage. Their patented Liquid Extraction System is the first ever tech to generate production from Utah’s 32-billion-barrel heavy oil resource. gases and doesn’t require high temperatures or pressures. In Asphalt Ridge—Petroteq has an estimated 86 million barrels of oil equivalent worth $5.2 billion at today’s prices. The cost of production is expected to come in at only $25 a barrel. The plan is to reach 5,000 bpd by 2019 at a cost of production as low as $18 per barrel for some portions of the project. There’s potential, says Petroteq, to achieve 30,000 bpd with proven reserves. And, that isn’t even their biggest opportunity. Petroteq’s technology could generate huge licensing fees around the world, and it is eyeing the opportunity to file patents in all countries with oil sands reserves. They’re not only targeting the 1 trillion-plus barrels of oil in sands in Utah, Colorado and Wyoming, but through potential licensing deals, the trillions of barrels worth of trapped oilsands potential everywhere around the world. The OPEC/U.S. energy war is heating up. Recently, American production of crude oil rose to an all-time high, surpassing 10 million bpd. The key to this battle is technology. And the U.S. national interest right now is all about increasing domestic energy sources. Most investors wouldn’t think of the oil sands as a solution. Oil sands have a bad reputation: people tend to think of oil sand extraction as dirty and expensive. The tar sands of Canada are the most notable example of this. Despite being one of the largest petroleum deposits on earth, many majors had to divest from their holdings as the oil price crash made production prohibitively expensive. Petroteq (TSX:PQE.V; OTC:PQEFF) is getting ready to change oil sands’ reputation, particularly for dry oil sands like those in the American west. Technological advances such as their patented Liquid Extraction System will become a key focus for revolutionizing the economics of U.S. oil sands deposits. Existing oil sands extraction technologies use tons of water and leave toxic trailing ponds. Petroteq’s system produces oil and leaves behind nothing but clean, dry sand that can be resold as fracking sand or construction sand or simply returned to Mother Nature. Better still - it is expected to achieve production costs of as low as $25/barrel for volume production. The end result? The extracted crude oil is free of sand and solvents and then pumped out of the system into a storage tank. And, their technology is already proven in test results! Petroteq has already extracted 10,000 barrels of oil at the original plant on its site at Asphalt Ridge, Utah - with amazing results. The process recovered over 90% of the oil in the rock. For Utah’s locked in oil sands, this tech could be a silver bullet. The State of Utah is home to more than half of all U.S. oil sands deposits, with more than 32 billion barrels of oil equivalent waiting to be extracted from 8 major deposits. It’s also got fantastic infrastructure. There are 5 major refiners with truck routes to Salt Lake City. Even better, this oil can be accessed directly from the surface, so there’s little risk of running into a ‘dry well’. Until now, the problem has been economics. At current prices, Utah oil sands were a non-starter, but then Petroteq came along. 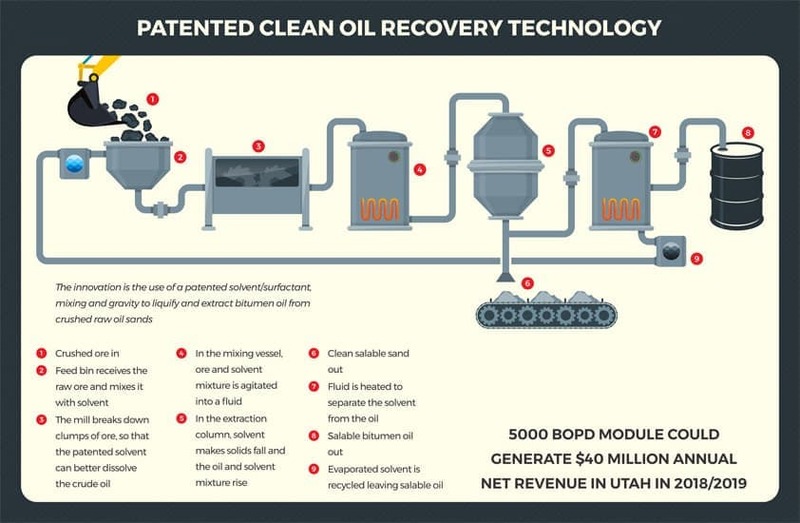 Its patented oil extraction technology was the very first to generate production from Utah’s massive heavy oil resource. Petroteq acquired Asphalt Ridge for $10 million, giving it the rights to exploit a huge deposit of an estimated 86 million boe of bitumen in eastern Utah. At current oil market prices, the field’s oil has gross value of up to $5.2 billion. That’s big news for a company with a $60 million market cap. Their plant is just coming online, and it’s planned to produce 1,000 bpd at an expected cost in the mid $20s per barrel. Soon, assuming all goes as expected, they’ll be getting ready to ramp up production to 5,000 bpd. But the real opportunity is bigger than that. The potential for mass application of Petroteq’s (TSX:PQE.V; OTC:PQEFF) new technology is vast. They’re ripe for safe, inexpensive exploitation through Petroteq’s new methods. Oil sands owners may jump at the chance to use Petroteq’s technology through licensing or other collaboration. Plus, there are 20 other countries with bitumen deposits like the ones at Asphalt Ridge. Canada alone has 100 billion boe of oil sands worth $6 trillion, and worldwide reserves are estimated at 500 billion boe. So far, Petroteq’s technology has worked best on dry oil sands, which comprises a big portion of worldwide oil sands reserves. PQE plans to license its technology globally for even greater revenues. Petroteq’s EOR technology isn’t their only licensing opportunity. Nothing could change oil industry supply chain management more than blockchain. Supermajors BP, Shell and Statoil are getting into blockchain because it promises to make oil and gas trading and production a lot easier - while eliminating middle men. With PetroBLOQ, Petroteq is developing the first blockchain-based platform exclusively for the oil and gas sector’s supply chain needs—GLOBALLY. It was cited by Geoffrey Cann, director at Deloitte specializing in oil and gas, as a contender for best blockchain tech in the energy sector. In January PetroBLOQ reached an agreement with Pemex, the Mexican state-owned oil company. Through its PetroBLOQ subsidiary, Petroteq is developing a supply chain management system for Pemex that could radically improve efficiency. Ultimately, its blockchain platform could end up involved in every single transaction in the oil and gas supply chain—upstream, midstream and downstream. The management at Petroteq (TSX:PQE.V; OTC:PQEFF) is a cut above the rest: they know the energy sector and the world of blockchain intimately. More importantly, they’re betting on themselves to win. Chairman Alexsander Blyumkin has invested millions in the business, including an interest-free loan for the production facility at Asphalt Ridge in Utah. Founder and CTO Dr. Vladimir Podlipskiy is a 23-year veteran in chemistry, R&D and manufacturing, and a chemical scientist from UCLA. He’s the oil extraction tech genius with a line-up of patents for everything from oil extraction and mold remediation to fuel reformulators. Chief Geologist Donald Clark, PhD, a widely published geologist and consultant, is the blockchain tech mastermind in this group. Together they bring the experience necessary to execute on Petroteq’s ambitious agenda. Oil prices have slowly been ticking up in recent months, thanks in large part to spikes in geopolitical risk at major energy choke points around the globe. The market is dramatically tighter than even just a few months ago. OPEC is over-complying with the production cuts, and demand is still growing. The inventory surplus is virtually gone. Against the backdrop of a much tighter oil market, an unexpected supply outage could push things over the edge. It could come from anywhere: the conflict in Syria, war with Iran, North Korea, Russia or China. There’s even the possibility of political unrest in Saudi Arabia. Violence broke out in Iraq in October as Iraqi troops seized the oil-town of Kirkuk from Kurdish forces. Tensions could escalate at a moments notice. In Venezuela chaos could trigger a supply cut-off, sending prices skyrocketing. Meanwhile, Mexico is poised to elect their very own version of Hugo Chavez. Saudi officials are already eyeing $100 per barrel as a goal - which would inflate the value of Saudi Aramco ahead of the company’s IPO next year. Now with the U.S. pulling out of the Iran nuclear deal, it has said it will re-impose “snap-back” sanctions on Iran. What will that do to the world’s daily oil supply? “It firms the case for the Brent-at-$70-plus story. With Bolton, I think we go beyond the discussion of sanctions -- are we going to start thinking about regime change in Iran?” asks Helima Croft, chief commodities strategist at RBC Capital Markets. In that scenario, Petroteq’s netbacks could shoot through the roof. Now is the time to pay attention to Petroteq (TSX:PQE.V; OTC:PQEFF) for a single big reason - the likely imminent spike in demand for heavy oil. President Donald S. Trump has announced a $1.7 trillion infrastructure plan. Billions of dollars will be deployed to rebuild U.S. infrastructure and infrastructure construction requires exactly the kind of heavy oil that Petroteq can produce from oil sands. This is a story of extracting costs as low as $25 per barrel of oil… in a $70 world. Not only that - but Petroteq is the only known company with the technology to tap trillions of barrels of “trapped” heavy oil in Utah, Colorado and Wyoming. The U.S. is positioned to become the world’s dominant energy producer. And it’s all thanks to innovation from companies like Petroteq (TSX:PQE.V; OTC:PQEFF). With both huge production and licensing potential, Petroteq (TSX:PQE.V; OTC:PQEFF) represents an incredibly leveraged way to play expected higher oil prices. This is your opportunity before the next oil shock. Go online or call your broker today to learn more about Petroteq. This news release contains forward-looking information which is subject to a variety of risks and uncertainties and other factors that could cause actual events or results to differ from those projected in the forward-looking statements. Forward looking statements in this release include that PETROTEQ will be able to produce oil as currently scheduled, at the rates of production announced and at the targeted low costs from its Utah property; that PETROTEQ will successfully develop a blockchain supply chain solution for the oil industry; that it will have customers and contracts for its supply chain technology; that oil will be as much in demand in future as currently expected; that the price for oil could rise considerably from current prices and that Petroteq would benefit by it; that PETROTEQ’s technology is protected by patents and that it doesn’t infringe on intellectual property rights of others; that PETROTEQ will find licensees for its technology and that it can patent its technology in many countries; that PETROTEQ’s technology will work as well as expected; that blockchain technology will help PETROTEQ create a supply chain management system which can handle all transactions in the oil supply chain; and that PETROTEQ will be able to carry out its business plans. These forward-looking statements are subject to a variety of risks and uncertainties and other factors that could cause actual events or results to differ materially from those projected in the forward-looking information. Risks that could change or prevent these statements from coming to fruition include that the Company’s patents and other technology protection are not valid, patents may not be granted in countries where PETROTEQ wants to license its technology; production of oil may not be cost effective as expected, technology development costs may be much higher than expected, there may be construction delays and cost overruns at the production plants, PETROTEQ may not raise sufficient funds to carry out its plans, changing costs for extraction and processing; technological results based on current data that may change with more detailed information or testing; blockchain technology may not be developed to be as useful as expected and PETROTEQ may not achieve its business plans; competitors may offer better technology; and despite the current expected viability of its projects, that the oil cannot be economically produced with its technology. Currently, PETROTEQ has no revenues. This communication is for entertainment purposes only. Never invest purely based on our communication. We have been compensated by PETROTEQ to conduct investor awareness advertising and marketing for TSXV:PQE and OTCQX:PQEFF. Therefore, this communication should be viewed as a commercial advertisement only. We have not investigated the background of the company. Frequently companies profiled in our alerts experience a large increase in volume and share price during the course of investor awareness marketing, which often end as soon as the investor awareness marketing ceases. The information in our communications and on our website has not been independently verified and is not guaranteed to be correct. Good Luck. Please make my Gas cheap.